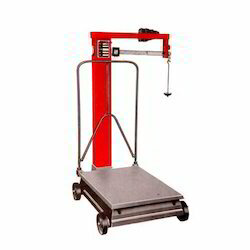 Our customer can avail from us Mechanical Platform Scale. For meeting the different requirements of our clients, we are engaged in supplying and distributing Mechanical Weighing Scale. 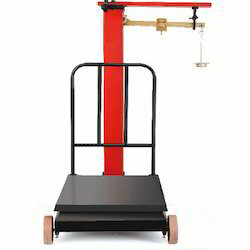 We are one of the recognized firms engaged in supplying and distributing Steel Yard Type Mechanical Platform Scale. The special steel, zinc plated is used to manufacture the steelyard. Moreover, these are graduated with accuracy to the full capacity of the machine with machine cut notches. Without losing weights, this system helps in giving quick and accurate weighing. Owing to the special notch protection bar, wear & tear of the notches is minimized. For holding the steel-yard while loading and unloading to minimize wear & tear on knife edges & bearings, a quick-tumbler locking device is also offered. For smooth movement, major poise is mounted on roller bearings. The brass polished scale with brass polished bracket are engraved with marking is fixed at an angle to the steel yard for hassle reading. The brass polished minor poise moves on it for final reading. For quick zero adjustments, balance box at pillar end of the steelyard is provided. Sensitivity ball is also incorporated in it to restore original sensitivity instantly. 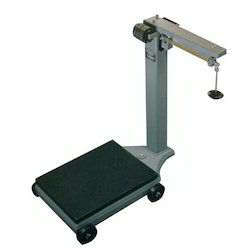 Looking for Mechanical Weighing Scale ?